'Tis the season for late nights, libations, and loads of sweet treats! We love all of the festivities this time of year brings, but it can tend to overwhelm our schedules as well as our health and wellness habits. Osmosis Holiday Kits are the perfect tools to pamper your skin, internal wellness, and makeup looks so you can stay holly jolly all season long without skipping a beat! 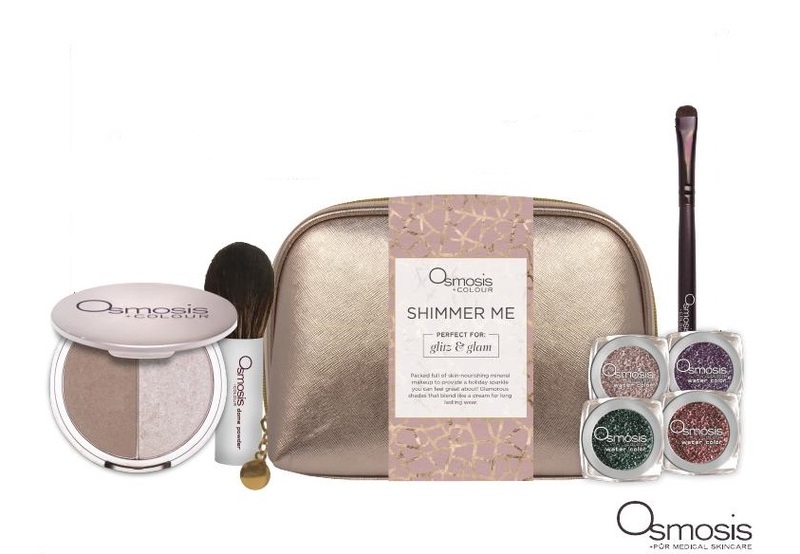 Loaded with glamorous Mineral Makeup from Osmosis, you can spice up your look for any event while feeding your skin with vitamins and nutrients! Boost your confidence with a little extra glitz and glam. That's the spirit! Contour Duo - A matte bronzer alongside a shimmering highlighter that helps define and flaunt your best features. Water Colors - Hydrating loose minerals with a radiant glimmer on high pigment color that will transform your eyes. Includes: Pewter, Opal, Azure and Pink Champagne. Dome Powder Brush - Perfect for color formulas of all types. The full rounded brush is great for a light base, blush or bronzer application. Smudge Brush - Use to apply the brilliant colors of the Water Color collection across the lids. Combat dull winter skin with this super-star lineup of top-selling skincare products. Complete with products to plump, hydrate, smooth, and nourish, your skin will radiate a youthful glow all season long! Whatever brings you joy this holiday season, Osmosis is here to help you achieve it!